Adventure Safety provides a range of satellite phone and satellite tracking devices, and plans, to meet the needs of solo travellers, expeditions. mariners, and businesses. Wherever your adventuresome spirit takes you, our reliable communication systems support you when it’s needed most. Call Jeff Dusting on 0407 745 403 to discuss your requirements or view the solutions on offer here. Mobile Everywhere - whereever you are you can be in touch with your choice of the Iridium, Inmarsat, Thuraya, or Globalstar networks. 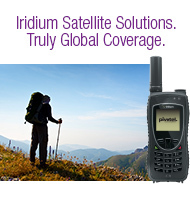 Iridium is a truly global network that features Pole to Pole coverage with market leading reliability. Iridium is built upon a large number of orbiting satellites that pass calls to a ground station in Arizona (USA). Recognized by yachtsman the world over Inmarsat is renowned for quality and reliability with affordable handsets amd near global coverage - not the Poles. 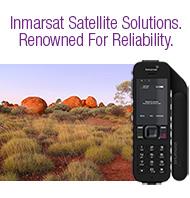 Inmarsat relies on geostationary satellites. Thuraya has versatile and practical solutions for consumers and business, offering dual mode phones ( GSM/Satellite) and Sat Sleeves that convert a smart phone to a satellite phone. Thuraya's versatility extends to its plans with custom offers for Maritime voice and data. 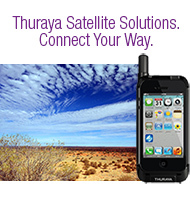 The Thuraya network relies on two geostationary satellites covering more than 140 countries. Being a Geostationary satellite - if your antennae can "see" the region of the sky where the satellite is located you can make and receive calls. Within In Australia this means a view primarily from WNW to North. With recent upgrades to network performance based on Gen2 Satellites, Globalstar provide a low cost of entry for both handsets and data plans. 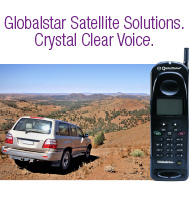 Globalstar uses geostationary satellites and calls are passed from the satellite to local ground stations, in Australia at Mt Isa, Dubbo and Meekatharra.